- Aside from being one of Star Trek's most famous episodes, this episode is also a prerequisite for watching TAS: Yesteryear. 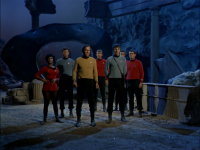 - This episode won the 1968 Hugo Award for Best Dramatic Presentation. - The look on Sulu's face when he was injected with Cordrazine. - Kirk and Spock questioning the Guardian of Forever. - Kirk trying to explain Spock to the police officer. - Edith Keeler's speech: "One day soon man is going to be able to harness incredible energies. Maybe even the atom. Energies that could ultimately hurl us to other worlds in some sort of space ship. And the men that reach out into space will be able to find ways to feed the hungry millions of the world and to cure their diseases. They will be able to find a way to give each man hope and a common future." - Spock discovering that Edith Keeler may be supposed to die. - McCoy on a rampage. 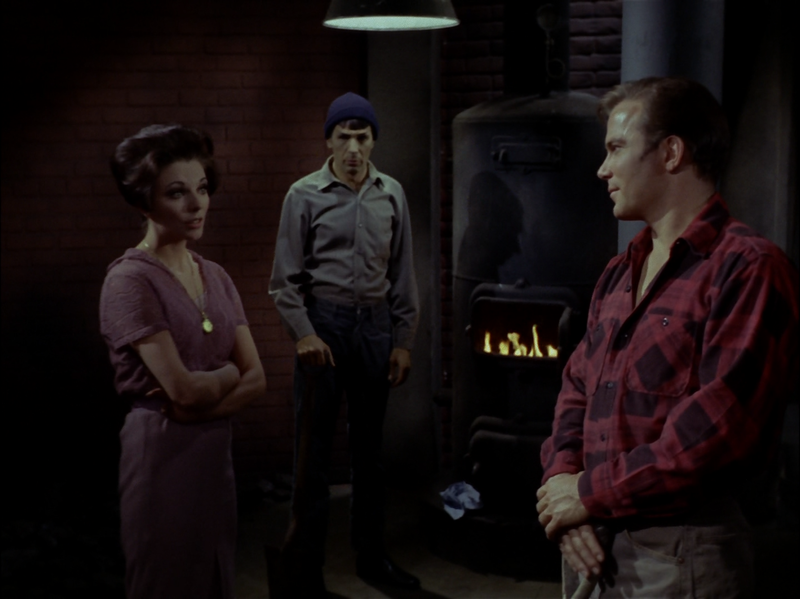 - Spock proving Edith Keeler must indeed die. 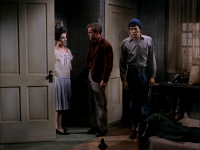 - Edith Keeler's death and Kirk restraining himself from saving her. What if going back in time and saving one person from dying in a terrible tragedy led to an even greater tragedy for millions more people a short time later? 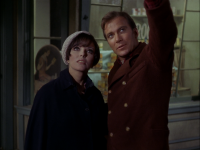 The City on the Edge of Forever is not the first episode of Star Trek to deal with issues raised by contaminated timelines, but it's certainly the best one to tackle the issue so far as it features both excellent humor and a terrific dark dramatic story. The humor in McCoy's insane rampage, the drama in Edith Keeler's death, the dynamic nature of the storytelling, the unusual pacing, and the unusually high quality acting on the part of the main cast make this story easily among the most memorable episodes produced thus far. 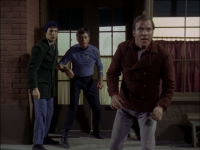 Unlike previous dabbles into time travel storytelling such as Tomorrow Is Yesterday, this episode treats the implications of time travel notably more responsibly. 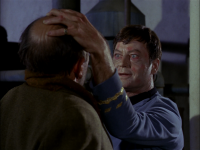 Even little details such as Spock remarking on how much useful historical data he could collect using the Guardian of Forever are an excellent illustration of this, but no scene is more compelling in this respect than Keeler's death. Beyond the dramatic appeal, there is also time travel intrigue. She died crossing the street, trying to find out what Kirk, McCoy, and Spock (well maybe not Spock...) were all so happy about. Thus, they are the direct cause of her death! 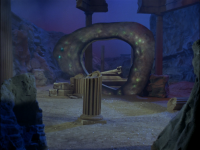 This episode didn't merely acknowledge the implications of a time travel paradox, it used one for dramatic effect! Though no matter how captivating this story may be dramatically, it is not without its flaws. Chief among the issues in this story is the Guardian of Forever itself. What was it doing there? Why didn't they investigate it any further? Why did they just leave such a powerful and potentially dangerous piece of technology laying around there for anyone else to find and misuse in the way McCoy accidentally did? 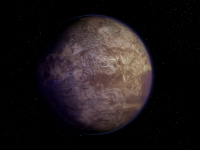 Why was the landing party insulated from the changes to the timeline? Did the Guardian of Forever protect them somehow due to their proximity to it? This episode definitely treated time travel more responsibly this time around, but still not responsibly enough for a perfect score I'm afraid. With more careful writing this episode certainly could have earned one. 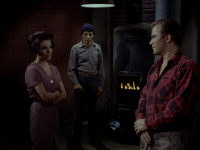 Well, I suppose I can't be applauded for my originality; like the majority of fans, this is for me one of the best TOS episodes ever. I think the reason I find it so enjoyable (I never once feel the need to skip forward) is that it takes the show out of its comfort zone. 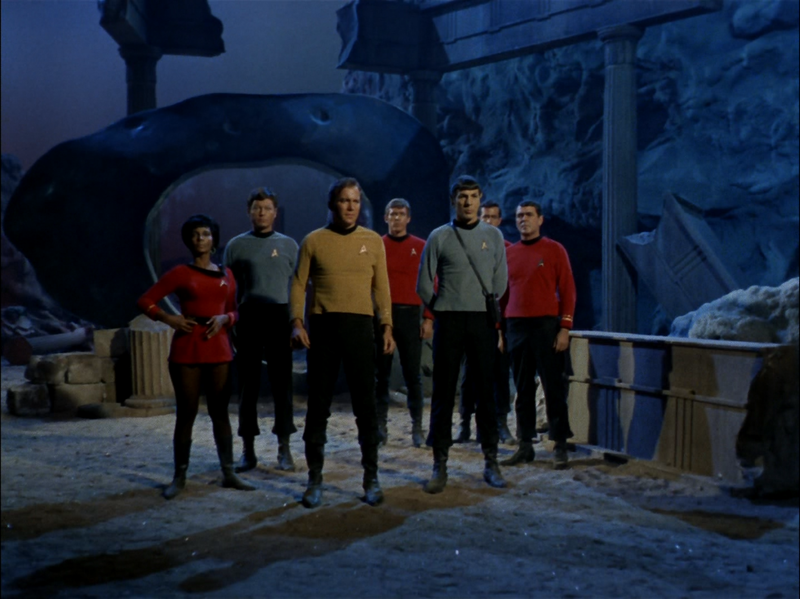 No redshirts, no all-powerful, murderous or otherwise interfering aliens, no fight scenes, no long, penetrating Kirk-stares... it flows very well. I really appreciate all the detail in the guest characters, the background people, the scenery - as well as in the little twitches in the characters' expressions. As you said, the acting is excellent. With all of this going on, I wasn't too bothered about their not wrapping up the business with the Guardian of Forever. 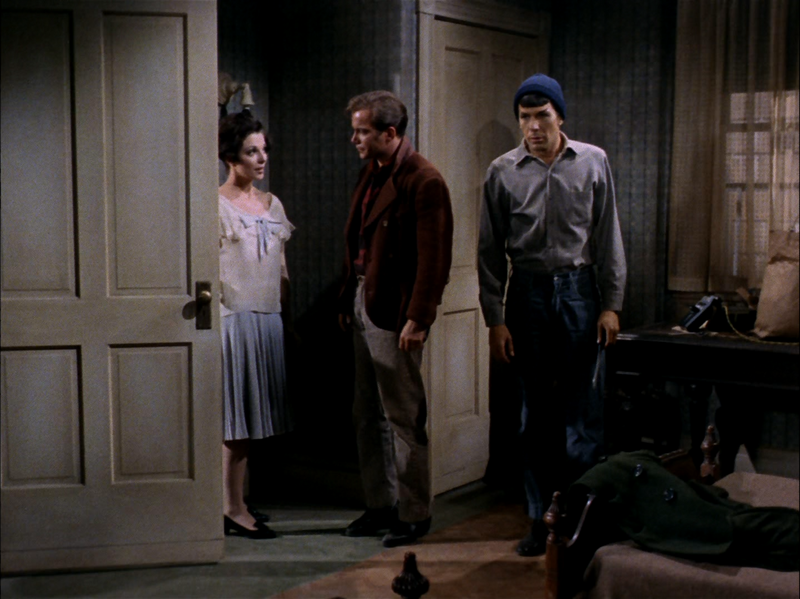 In fact, I think it makes the episode rather more real - Kirk is in no mood for mysteries, he just wants to "get the hell out of here". The episode had to end there; anything afterwards would have felt false. Of course there is all the controversy concerning this episode. I have never read Ellison's original script, although I think it is available, but from what I have read about it it is even more powerful than the episode. I enjoyed greatly that it dealt with time travel in a very rationale way. The story itself was great and the way the writers wrote in Keeler's insights were perfect, even if slightly corny. And tying her into the existing and the alternative history was plausible. Finally the underlying love story made sense and was heart felt, especially Kirk watching her die at the end. And for me I found the guardian excellent. It was perfect advanced technology scifi the way they did the guardian and I loved the effects and sounds at the portal. This is still my favorite episode of the entire universe although there are many other excellent episodes. Interesting that it was written by an excellent alternative fiction writer. Amok Time was also by an established scifi writer and another of my favorites. 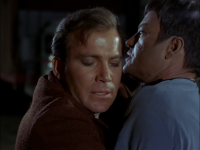 Shatner's performance here makes me think of the overall issue of William Shatner's acting. He is a very erratic actor. It is often commented on how he overacts, over emotes, does those trademark pauses between words etc. It's all true. The irony is that he actually does have acting chops, he just lacks restraint. The great range he shows here-the charm, the humor, to the extremely believable pathos and anger at the end shows off where his strength's are as an actor when he just shows a little restraint. Kethinov raises just about every issue that came to mind as I was watching this episode, which I thought to be very good but not without some problems. Time travel stories are always fraught with peril, and this one is no different. As is stated in Kethinov's review, I feel that some of it could have been explained with a tiny bit of smart exposition. Perhaps the landing party WAS insulated from the greater effects of the time distortion, but the fact that this issue isn't even raised by any of the crew was glaring. I also found the pacing a bit odd. The romantic relationship between Kirk and Keeler seemed both rushed and forced. 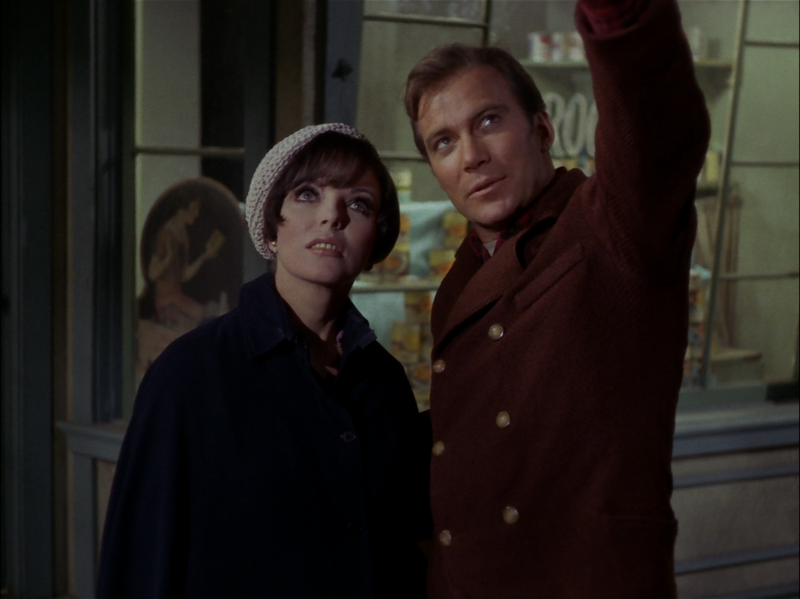 It was difficult to see exactly what Keeler saw in Kirk, and her strange intuition was a bit nebulous. This part of the story could probably have used more time to develop, though this is unrealistic for a 50-minute TV show episode. These problems, though, are fairly minor. The overall story was a strong one, and the tragic and emotional punch at the end may be the strongest of the series so far. The entire story was a creative reworking of the classic, "If you could go back in time and kill Hitler, would you do it?" idea. By flipping the script and asking whether you would allow a good person to die in order to save millions, this story adds a far deeper and more probing question. I didn't find this episode to be my absolute favorite one, but it may be the one that stays with me the longest. Under "problems", you list "none", and then in the narrative proceed to list several problems! Clark Gable did not appear in any movies in 1930, and he was far from a household name at the time, yet Edith expresses great puzzlement when McCoy and later Kirk don't recognize the name. 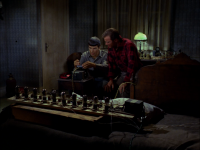 At one point, Spock says he needs three or four pounds of platinum, apparently unaware of how rare and expensive platinum is. Hard to believe, since Spock usually seems to know a lot about earth and it's history. When the timeline has been restored (Edith hit by truck), Kirk and Spock, followed by McCoy, return through the Guardian of Forever - but they are leaping through it. How do they know to "leap"? As mentioned by others here, there are always problems with time travel episodes. 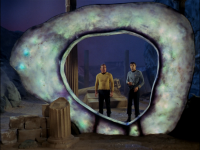 If there never was an Enterprise, then how did McCoy get to the Guardian of Forever in the first place?